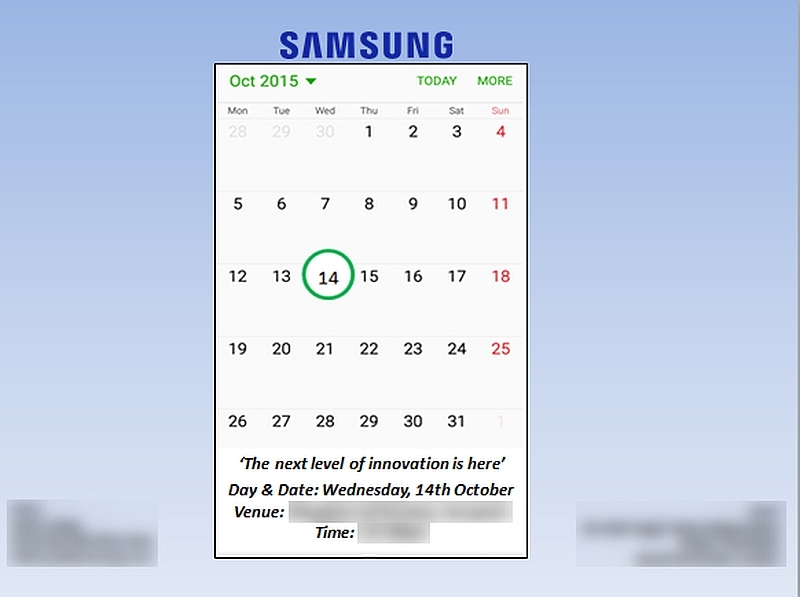 Samsung has sent out press invites from an event in Gurgaon on Wednesday, scheduled to start at 12:30pm IST. The company is expected to either launch its recently-unveiled Gear S2 smartwatch, or finally launch the much-anticipated Galaxy Mega On or Galaxy Grand On smartphones. The press invite only states, “the next level of innovation is here,” giving no clue as what product it would launch. The Samsung Gear S2 and Gear S2 Classic were showcased during IFA 2015 last month. The Gear S2, which is the company’s first smartwatch with a circular dial, is based on Tizen OS, and faces competition not just from Apple but also from a variety of manufacturers using Google’s Android Wearsoftware. The company said Gear S2’s frame will rotate to let users access apps and notifications. The Gear S2 will come in two styles – the modern Gear S2, and the Gear S2 Classic. Bearing a 1.2-inch circular Super Amoled display with a 360×360 pixel resolution, the Gear S2 is powered by a 1GHz dual-core processor coupled with 512MB of RAM. It features 4GB of inbuilt storage, and is IP68-certified dust and water resistant. It supports Wi-Fi 802.11 b/g/n and Bluetooth 4.1 connectivity, apart from NFC, which enables mobile payments. Accelerometer, gyroscope, heart rate sensor, ambient light sensor, and barometer are also included. A 250mAh battery backs the wearable. Also possible is that Samsung might launch its Galaxy Mega On and Galaxy Grand On smartphones in India. The smartphones got certified on China’s Tenaa and hit the benchmark tests last month. From the past leaks the Android 5.1.1 Lollipop-based Galaxy O7 or the Galaxy Grand On would feature a HD resolution display; a 64-bit quad-core Qualcomm Snapdragon 410 SoC; an Adreno 306 GPU; 1GB RAM; 8GB inbuilt storage; a 12-megapixel rear camera, and a 5-megapixel front-facing camera. As for the Samsung Galaxy Mega On, the smartphone has previously been tipped to sport a 5.5-inch HD TFT display; 1.2GHz processor; 1GB of RAM; a 13-megapixel camera; a 5-megapixel front-facing camera, and 8GB of inbuilt storage.